One couple says the election has put a huge stress on their marriage. Meditation teacher Jeff Warren hosts a session with Pennsylvania voters. ??? Stress is nothing few Americans. It's almost our national past time, but this election is pushing some people over the dredge, dread over the outcome turning some friends and family against each other. We set out to help voters in one swing state to find their accidezen. She has tremendous hate in her heart. I feel very stressed right now. This is not someone who should ever have the nuclear codes. I haven't been sleeping well at night. People have both sides of the fence feel stressed out about it. The worst election I think I ever remembered in my lifetime. This election leaving you with insomnia, stomach problems? You might be suffering from election stress disorder. Is it a disorder. I think it's tongue and cheek, but I think there's stress impacting people around the election. Reporter: According to one study more than half Americans are feeling anxious or stressed over this election. It's a catastrophe. They're looking at worse case scenario possibilities if their candidate doesn't win. Reporter: I read doctors around the country are reporting things like stomach ailments, sleep problems, compulsive cleaning. Are you seeing things like that? Yes. Reporter: I find during the dakotas I'm stress eating. Such a nasty woman. Reporter: Now I really feel like I'm on the couch with you. I guess I am. Why don't you lie down? Reporter: I should lie down. As it turn out, I'm not alone. We decided to head to the battle ground state of Pennsylvania to see how voters are coping. Here we are in Philadelphia. Behind me is Independence hall. People are genuinely and I think often justifiably freaking out. It's turning some family living rooms into battle grounds. Would you describe yourselfs as stressed about the election? Yes. Having a sexist bully, having his if I thinker that close to a nuclear weapon scares me. Reporter: She's pro Clinton. I don't trust Clinton. I think people are tired of same old politics. I'm a big believer in women's rights. Why would you vote for Donald? Reporter: They've been married 25 years and this is the first time this happened to them. The stress has been fun. We were on our way, I was dressed. Heels. I got out of the car. It was moving. This one thinks he's funny. He said wouldn't it be funny if I put a trump sign on the front lawn and you put two or three Hillary signs? I said there's nothing funny about it. I was so mad that I left. And I walked over -- I -- I'd have to do it, but I think it might be closer to five miles home. He thought it was over, he came home, and there was a suitcase. Reporter: You walked to the precipice of separation? Yeah. Reporter: What do you advise about a situation like that? Don't talk about politics. Reporter: Some people are using puppies and kittens to get through the season. Even Hillary Clinton prescribes this method. It makes you want to unplug the internet or just look at cat pictures. Reporter: The experts also recommending turning off your TV, not right now, though, unplugging from social media, exercising, and then there's another method that I personally swear by, meditation. Going to make America calm again. Exactly. Reporter: That's why we brought in a nonpartisan ringer, a meditation teacher from Canada. Are people here feeling stress about the election? Yeah. I had it. I'm tired of the social media and watching my friends, my family fight with each other. I don't think that trump is a decent human being and I don't want him to represent our country. Reporter: Is it stressful to be in a room with people supporting the other candidate? No. I believe we're all entitled to our opinion. One of us is right and one of us is wrong. I was just kidding. Just kidding. I was trying to be funny. Reporter: Given the depths of the problem in terms of our divisions here, do you think medication actually could scale to be a useful force? Absolutely, I do. It allows people to make better decisions, and we need a world where people are making better decisions. We'll start with a few deep breaths. Reporter: We'll come back to them and see if they made any progress with election enlightenment later. You can do something proactive. We're going to meet a couple that has done that. It's counter programming against the vistrial we're getting from most of the media. Reporter: How has the stress been showing up? I feel like I have a dark cloud over my head, and I know I'm a lot grumpier than I used to be. That's how we started this project to put 28 artists from all over the city holding happy signs to premind us that isn't armageddon. People stop by the door and read the sign and step back and look up. They get this smile on their face. Reporter: In their studio, my producers and I pick the words vote and inspire to relieve some of our own election stress. Meanwhile back at the yoga studio. I feel a little lighter. Definitely. I think that was exciting. Reporter: Everyone including us, seems to be surprised by what 15 minutes of meditation can do. Regardless of the outcome, we're going to need to bring peace to ourselves every day. We have to see each other as more than labels and Republican and a trump or Hillary supporter. We have to see each other as people. Even though our candidate may not get elected or the world is going to end, I think we need to generally have practices like this happen more often so more people can feel the way we do right now. Reporter: This is Dan Harris meditating in Philadelphia. Thanks to Dan. If you want a guide at free. When we come back, Oprah's 2016 list of favorite things is here. Dan Harris sits down with author and speaker Gretchen Rubin to talk about mindfulness, breaking bad habits and finding better routines. 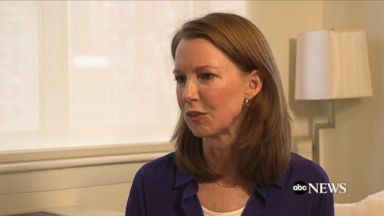 The Harvard social psychologist sat down with ABC News' Dan Harris to talk about "power poses" and how having good posture can lead to more confidence. Nightline co-anchor discusses his new book and how he found happiness. 'GMA' Debate Stress Test: Is the Election Stressing You Out? "GMA" tracked viewers' stress levels as Clinton and Trump faced off in the third and final presidential debate. ABC News' Amna Nawaz and political commentator Erin Schrode demonstrate stress relief yoga poses. Now Playing: 'GMA' Debate Stress Test: Is the Election Stressing You Out?